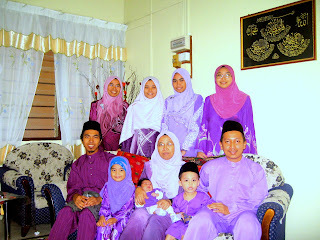 At last, our family celebrated our eid in Perak only for the second or third time after so many years living here. The last time I remember I celebrated Aidilfitri in Perak was I think more than 10 years ago as far as I remember. I'm not pretty sure, but it has been quite a long time. Before I went to further my studies at oversea, one of the thing that often came to my mind was that I'll be far from my family during raya. But, thanks to the fact that the Islamic calendar is 11 days less than the Gregorian calendar, somehow, the eid becomes earlier and earlier and it happens that the eid always fall during my summer break lately. Also thank God, I always managed to finish all my exams early and doesn't need to stay there during the festivals. Alhamdulillah. And talking about raya at oversea, I could still remember when I first celebrated raya there. I had an anatomy test on that morning, and we missed the eid prayer organised by the Muslim community there that morning. But we did organise our own eid prayer among our batch at the faculty prayer room. I didn't think anyone was excited of celebrating raya during that time, since everyone was so concerned with the anatomy result, which many have failed the test. The following day, I was among the only 1 of 4 Malaysian students in my place who went to the Malaysian Embassy in Prague to attend an open house ceremony organised by the embassador. I had Histology test on the following day, and as expected, we failed the Histo test. Thank God, it did not affect my average grade for that semester at all. Otherwise, I would blame myself for it. Enough about raya abroad. The fact is that I'm here in Malaysia right now and there's always 'denial-like' feeling when it comes to the end of the summer holiday. Keep in mind, unless we finish our winter exams very early, summer holiday is the longest holiday that we have in our academic calender. The second-longest holiday throughout the year is just 1-and-a-half week, and that comes at the end of the year. So, you can imagine how it feels when it's approaching the end of your longest holiday in the year, thinking about the stress and hard works that you need to face in future. Who says being a medical student is interesting? Let's go back to the raya topic. 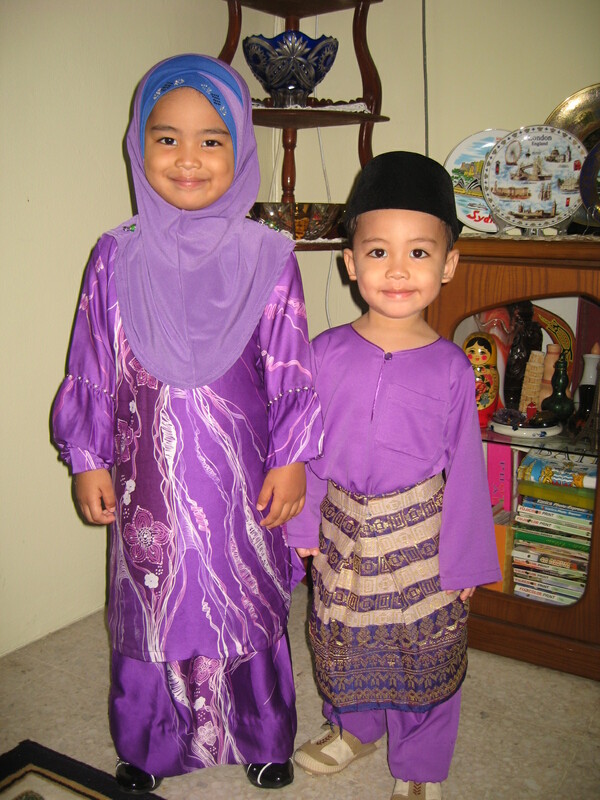 Thanks to Allah, our eid celebration this year was quite good, even though we didn't go balik kampung as usual. 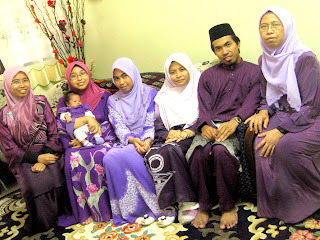 Our family theme this year is purple. I must say that I don't like buying a new baju Melayu during raya. It's not that I don't like to wear it, but for me, I just wear my baju Melayu once or twice a year, and every year when I got a new baju Melayu, I never wear my old ones. It's not because that I dislike, but it's simply because it's unsuitable to wear that clothes especially during winter in Europe. I think it's kind of a waste to buy a new one, given that you have an old one, but still in good condition and has just been worn once or twice (or trice the most). And I almost spoiled our family theme, by being the only person not wearing purple this year. 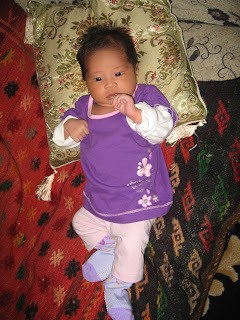 But, finally I decided to buy a new one on the very last fasting day, when my mum asked me again and again to do so. As a Muslim, it's a 'sunnah' or we are encouraged to visit our brothers and sisters during the eid celebration. I wonder which part in Islam encourage terrorism and fightings, as claimed by the Western countries. Thank God, during the eid celebration this year, I've met many people, some of whom I haven't met for more than 10 years. In previous years, I did not celebrate eid here, and I always miss the chance to visit the people here, many of whom are busy with their own job during other times. This year we didn't make 'ketupat', unlike other years. So, I didn't have chance to 'asah bakat'. My mom just made 'nasi impit' instead. For me, it tastes the same, but 'nasi impit' lacks the art, joy and the feeling of togetherness while doing it. 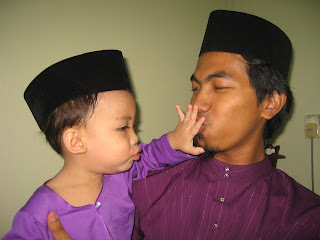 Since it's near impossible to summarise everything here, I just want to share some of our pictures during raya. The rest, you could see in my Picasa Web Photo Album. Talking about camera, I'm still wondering which camera shall I buy to replace my lost one. Does anyone have any suggestion? Last but not least, I would like to thank everyone who came over to visit me, those who I visited and everyone else who sent me eid regards either in the form of cards, sms, email, facebook message and others. May we are all blessed, and may Allah gives us chance to meet the holy month of Ramadhan again next year. haah.. mmg sgt cute, kan.. kalau dengar dorang cakap lagi la cute.. rasa nak cubit2 slalu.. haha..
yep.. mmg tgh survey2 camera baru.. my previous one hilang.. dah jmpe model yg bes, tp hold on dulu la..
tnggu kema buat kenduri la baru jmpe nmpak gayanye..
yep2.. purple bes.. like it too..